I sit under this finished quilt as I write this blog post. I had sometime this summer and fall when I did not have a camera and fell behind on blogging. Tonight I thought I would show you what I did complete this past year. 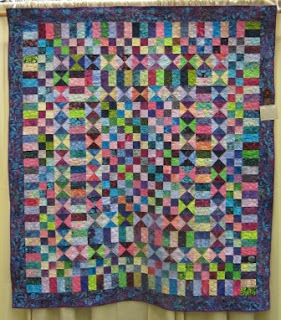 I started this quilt in the fall of 2010 and put it aside till Sept 2011 when I quilted it. 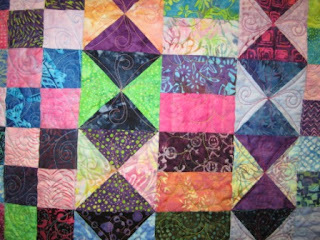 I had it ready for the Leduc guild quilt show in October. I quilted a little different this time, making sure to quilt the units in the rows. Fish Pond Quilt got quilted in Aug or Sept 2011 and also in time for the Oct quilt show. I was really happy to finish this one. I feel this quilt helped me get my sewing MoJo back on track. Sometime in 2009 and all throughout 2010 I had trouble finding the joy in quilting. I was in a funk. Have any of you had trouble sewing for the joy of it? I still did the long arm quilting for my customers but did not hang out in my sewing room to work on my quilts. 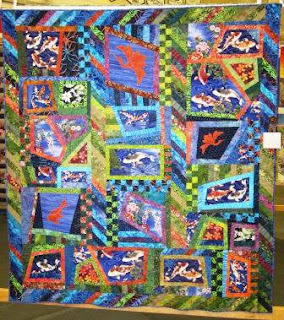 Why was I quilting? Why did it matter? This one was fun to finish yet it was still a challenge. I do not always do patterns. I like to make my own way. 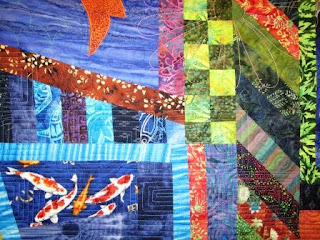 The detail of Fish Pond Quilt. I spent a few(5) days quilting this one. I know one day was spend digging out and looking for patterns I could quilt with. I also used some 12 wt thread for some of the quilt patterns. Much of the work was free hand. It turned out great. After the guild quilt show, I left it in the living room to use. My son #2 now snuggles under it tonight. 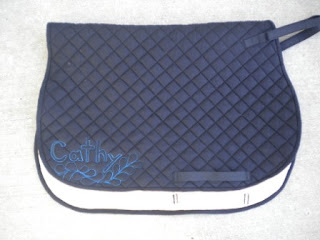 Custom saddle pad for horse back riding. I used a few recycled wool blankets and some wool batting and a black cotton on top. It was thick to quilt and I had some thread troubles but I was pleased. It has the straps to hook on to my saddle and girth and stay in place when I ride. The other side has my horses name on it. 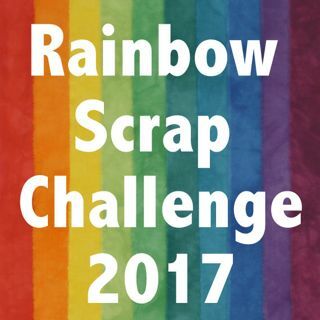 It was finished in Aug of 2011 and is well used already this year. This is the dog quilt. I got the top done at retreat in Oct. It now is on the quilt machine and should be done very soon. It is the disappearing nine patch. 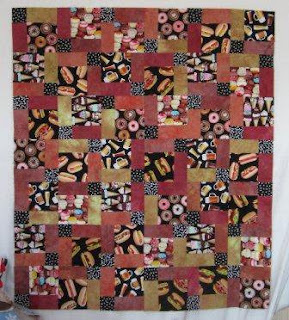 I am still laughing at a junk food quilt for the dog. All his favourite foods. One last small sewing project. 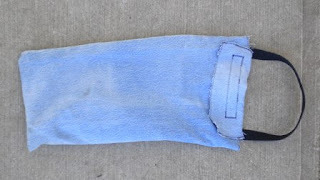 A bag for our high line ropes when we tie the horses in the mountains. It is made with the leg of a old pair of jeans. It close and holds the rope from running every were. And it can be hung up. I am considering on making a list of my UFO. I have many, and many are very old. I know I will not finish them all this year nor will I every finish them all. Some UFO may never get done. I think we out grow some projects. Maybe an old class project or a pattern that you did not like once you started it. I also have some smaller quilts that I was playing 'What if' and has no plans to finish as the What if was not working but I have learned from some of them still. I will work on my list and maybe just limit it to quilts I want to finish sooner.